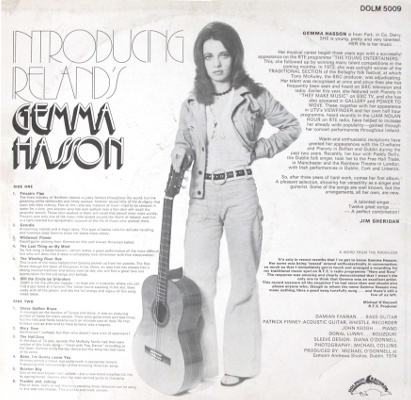 "The county Derry singer, Gemma Hasson, taught herself to play guitar as a schoolgirl, and made her first broadcast on RTE's radio programme, 'The Young Entertainers', in 1971." "In the years that followed she won many festivals and talent competitions, most significant of which was a small festival in Bellaghy in Co. Derry where the judge happened to be the BBC producer and folk music enthusiast Tony McAuley." "He was so impressed by her voice and her interpretation that he asked her to record for some of his radio programmes. The first of these was 'The Singing Town', a programme about the musical traditions of Belfast, which was closely followed by 'Slieve Gallion Braes', a personal remembrance by the poet Seamus Heaney of his early life in Co. Derry." "She very quickly came to the attention of other BBC producers and became a frequent contributor to Pat Lindsay's programmes 'Up Country' and 'What's West?' Another early admirer was the well-known television personality Gloria Hunniford who was working at that time with BBC NI and who included her in her own programme 'A Taste Of Hunni'." "She also came to the attention of RTE producer Michael O'Donnell and soon became a regular contributor to radio programmes such as 'Music On The Move', 'Here And Now' and 'Looking North'." "Radio soon led to television. 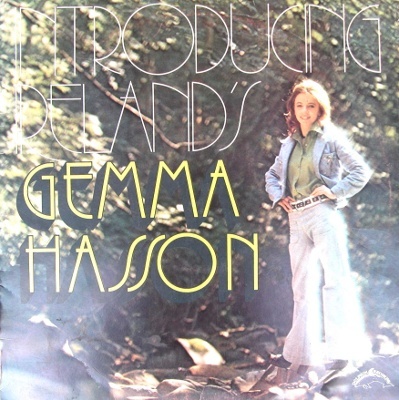 Her first appearance was on the BBC TV 'Gallery' series produced Gerry McCrudden. The programme was called 'A Tribute To Attie', and commemorated the bicentenary of the birth of Edward Bunting, the famous collector of Irish music. This was quickly followed by 'Power To Move', a nostalgic recollection of the linen mills of Belfast in the nineteenth and early twentieth century." 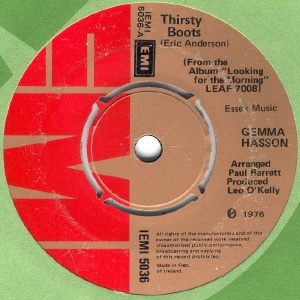 "She appeared twice on George Hewardine's 'Make Mine Country', and was a regular guest on Tony McAuley's Irish folk music programme, 'As I Roved Out'." "She continued to appear on RTE TV ,on such programmes as 'Open House' with Aine O'Connor, 'The Music Show' with 'Brian Eustace' and ,of course, 'The Late Late Show'." "She travelled twice to Canada to make television appearances there, the first of these in the 'Ryan's Fancy' series where she was guest performer alongside Tommy Makem. On her second trip she made a total of four programmes along with George Hamilton IV which were shown on Canadian TV and later shown on London Weekend Television." 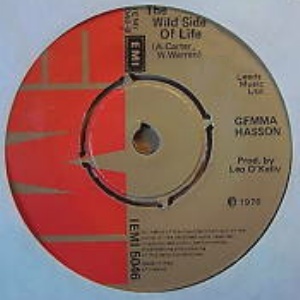 "As well as performing Gemma composed the theme music for a documentary film by the Derry film maker Terry McDonald. called 'The Secret' which was screened at the Cork International Film Festival and came in for high praise from the jury. This music was later included in a programme 'The Artist's Conflict In Ulster' which was broadcast on the BBC Overseas Network and later on Radio 4. A second film 'Requiem For Sally' for which she also provided the theme music won first prize in the fiction category of the Irish National Film Industry's annual film festival and the Guinness Prize for the best overall entry." "She also composed songs, best known of which is the lead track from her first album, 'Fincairn Flax', which is often mistaken for a traditional Irish folk tune, and also the final track on her second album, a very moving reflection on the Northern Troubles called 'Who Will Bury The Children?' "
"Right from the start of her career she was very much in demand for live performances. She appeared in all the top venues in the country, alongside some of the most famous performers of the day – the RDS (Dublin) with Horslips, the Carlton with The Chieftains and Planxty, the Whitla Hall (Belfast) with The Boys Of The Lough, the National Stadium (Dublin) with Australian star Kevin Johnson, and the Ulster Hall with The Chieftains." "One of her earliest admirers was the famous Irish promoter Jim Aiken. 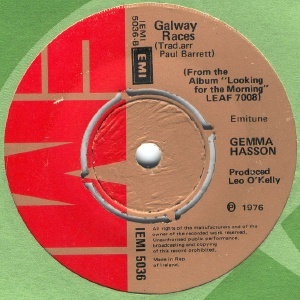 He was so impressed by her voice and by her performance that he gave her a UK Tour [1973-74] with the Wolfe Tones, Sean Dunphy and Paddy Reilly. In fact, there were very few limitations to the venues and the occasions for which her talents were called upon, from Fashion Shows to the Queen's Festival." "She recorded three albums. 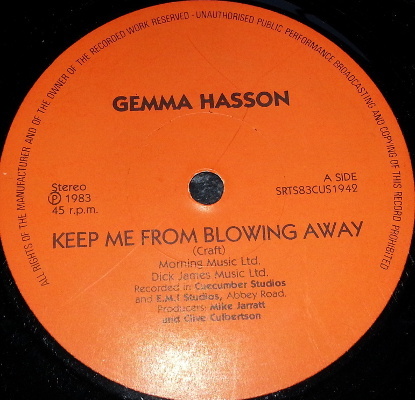 Throughout her career, Gemma never employed the services of a manager or agent, something extremely rare in the music business. She was never at ease with the long-term contracts and the detailed conditions most managers insisted on." 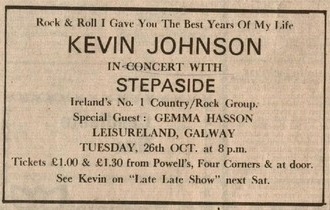 Advert for a gig at Leisureland, Galway on 26 October 1976. 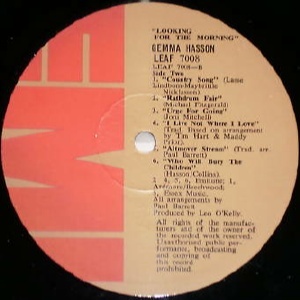 Notes: Gemma Hasson's three LPs mix folk and contemporary material and consist mostly of cover versions. 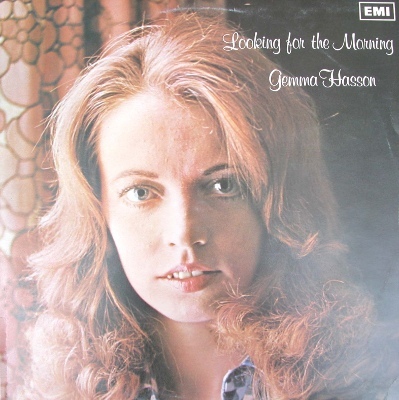 "Looking For The Morning" is the LP most rated by folk collectors. 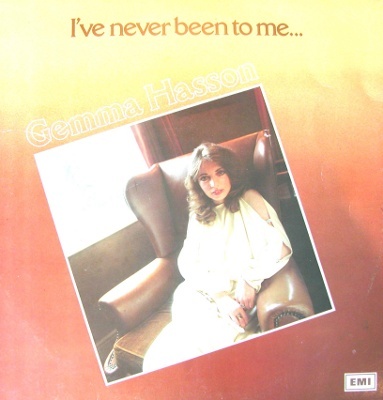 The third album "I've Never Been To Me" suffers many of the problems associated with the era. All three albums have become very hard to find. 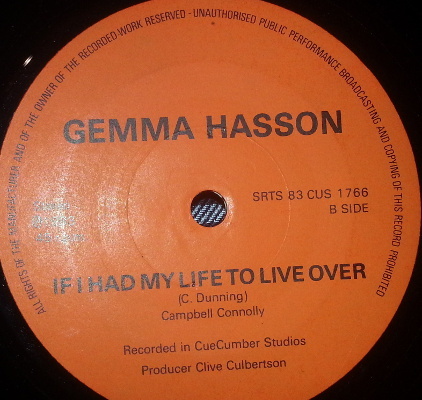 Notes: Recorded at Eamonn Andrews Studios in Dublin in 1974. Production by Michael O'Donnell. Patrick Finney – acoustic guitar, whistle, recorder. 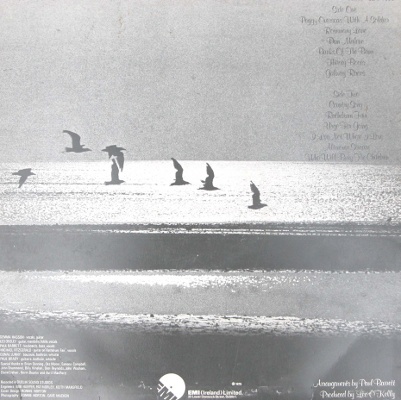 Notes: Recorded at Dublin Sound Studios, arranged by Paul Barrett, produced by Leo O'Kelly. All covers apart from the last track. The version of "Rosemary Lane" follows Tickawanda. 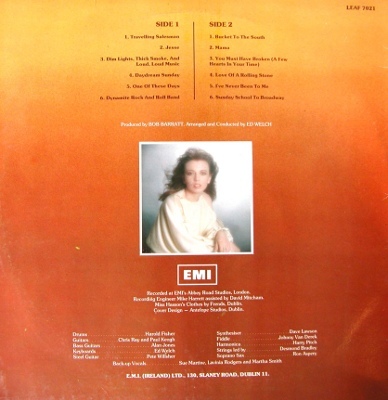 Both sides taken from the LP "I've Never Been To Me". Notes: Recorded at Abbey Road Studios, London, produced by Bob Barratt. Music arranged and conducted by Ed Welch. Sue Martine, Lavinia Rodgers, Martha Smith – backing vocals. String section led by Desmond Bradley. Produced by Mike Jarrett and Clive Culbertson in Cuecumber and Abbey Road studios. 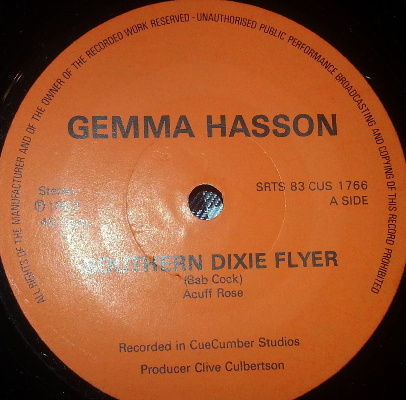 Recorded in Cuecumber Studios, Belfast, produced by Clive Culbertson. 7" - label? - ??? - 1983? - no PS? 7" - Ritz Records - RITZ 089 - UK - 1984 - no PS? 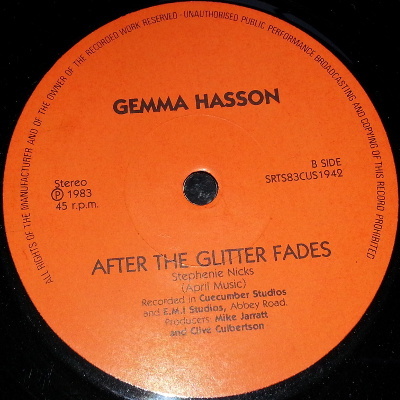 Collects singles and reworked versions of solo recordings made for BBC and UTV.